Identify green building criteria within LEED v4, WELL Building, Living Building Challenge, and ANSI/ASHRAE/USGBC/IES 189.1 that can be satisfied or supported with the specification of automated shading systems and environmentally-friendly shade fabric. 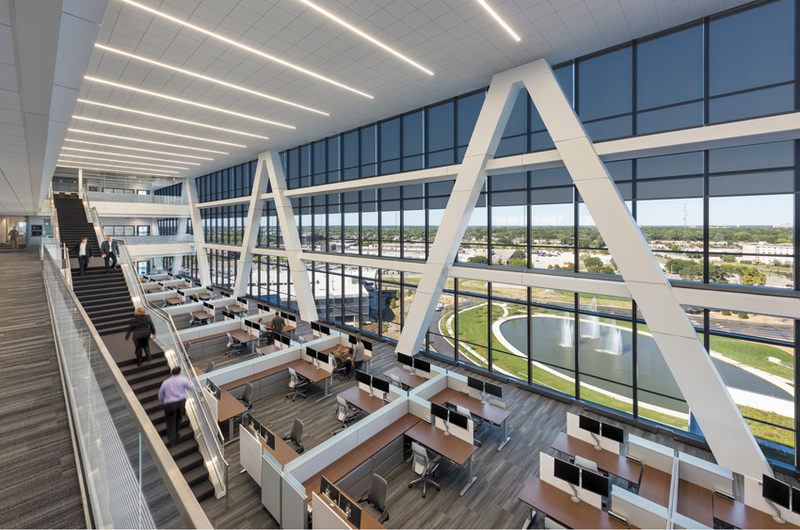 Describe how automated shading systems and PVC-free fabrics were used in the new ASID Headquarters, the first project in the world to receive Platinum certifications from both LEED and WELL Building rating systems. Describe how automated shading systems save energy and safeguard comfort and well-being by mitigating solar heat gain and maximizing the amount of glare-free daylight allowed into a space. Specify shade fabric and shading systems that can satisfy various materials and resources requirements across different green building systems. This description first appeared in the 1987 study Our Common Future, commissioned by the United Nations. Although there was a growing realization of its importance, the available tools, know-how, and market-driven motivation did not support an explosion of sustainable development at that time. Limited research had been conducted to explore what contributed to a sustainable environment. The first building standard ever focused on reducing energy consumption, ANSI/ASHRAE/IES Standard 90, was still in its infancy. The dearth of information led to some misguided perceptions on what constituted sustainable design. For example, windows were largely regarded as detriments to building efficiency, not vital for human occupancy. Automated shading systems are powerful tools that contribute toward earning many different green building criteria. The Zurich Headquarters (Schaumburg, Illinois), shown here, is pursuing a LEED Platinum certification. Thirty years later, the industry has created much of the infrastructure necessary to support a real sustainability movement. New technologies have been developed to offer a larger number of more efficient products and building systems. Several third-party certifications exist to quantify and qualify product life cycles, volatile organic compound (VOC) emissions, and material ingredient lists. Extensive research has been conducted since 1987 to dive more deeply into almost every aspect of sustainable design and its impact on the environment, economy, and occupant health. Concluding, for example, that providing building occupants with access to glare-free daylight and views has a positive impact on their mood, productivity, health, and well-being. Several green building rating systems have emerged to provide a structure, guidance, and a level of standardization to aid the design community in their sustainable design efforts. These advancements in technology, evidence-based direction, and green building programs better equip designers to achieve the basic goals of sustainable design, which are, as defined by the General Services Administration (GSA), the agency tasked with managing government buildings and real estate (among other things): reducing consumption of nonrenewable resources, minimizing waste, and creating healthy, productive environments. Now it’s time for the sustainable rubber to meet the green-built road and examine how designers can use the available products and systems to create projects that meet the criteria in the various green building programs. High-performance solar fabric creates an effective thermal barrier at the window by reflecting much of the radiant solar energy back outside or trapping the energy between the glass and the fabric. Although the specific focus and scope of any particular green building program may differ from another, they all seem to agree that providing occupants with access to glare-free daylight and exterior views is a basic tenet of sustainable design. One product uniquely suited to meet these demands is the automated shading system, and it is a solution that is less-involved, from a design perspective, than the efforts necessary to satisfy many of the other sustainable criteria. “When considering the spectrum of sustainable design solutions, automated shades are an easy yet powerful way to address both indoor environmental quality and energy-efficiency considerations,” explains Brent Protzman, director of building science and standard development, Lutron Electronics. This course will explore how automated shading systems and environmentally friendly solar fabric contribute toward satisfying sustainable design criteria found in four different green building rating systems in use today: Leadership in Energy and Environmental Design v4 (LEED v4), the WELL Building standard (WELL), the Living Building Challenge, and the latest version of ANSI/ASHRAE/USGBC/IES Standard 189.1 (Standard 189.1). The intertwined nature of the health of the environment, health of building occupants, and the economic value that must be created in a business venture is one of the aspects that makes sustainable design so compelling. It can also leave designers in a bit of a quandary, as it requires the simultaneous achievement of goals that sometimes seem at odds with one another. For example, providing people with access to daylight and views is an important piece of sustainable design, but that access can cause discomfort and wreak havoc on HVAC system efficiency and productivity if glare and solar heat gain occur. Luckily, there is a solution that enables designers to balance the demand for more daylight exposure with the need to provide adequate protection from solar heat gain and glare. 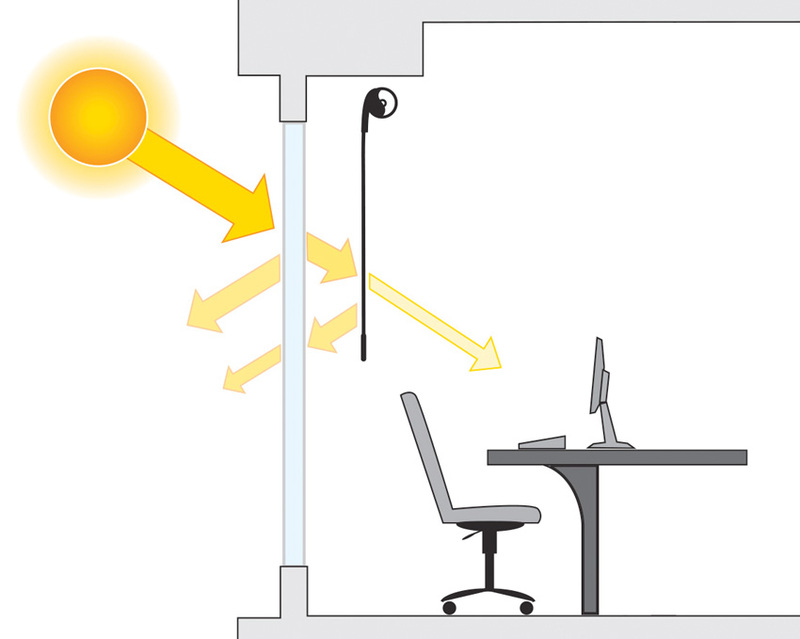 Automated shading systems are essentially sustainability multitaskers at the window. They actively and automatically manage the presence of daylight in the space, which enables automated shading systems to make a significant contribution to sustainable criteria in many ways. These systems can mitigate solar heat gain and maximize the presence of glare-free daylight on the interior. Beyond providing access to daylight that will not disrupt the performance of employees or cause discomfort, maximizing the presence of daylight in a space can also save lighting energy if the electric lighting system is equipped to reduce light levels when sufficient daylight is available. Solar shades can provide a continuous view to the outdoors regardless of whether the shade fabric is deployed or retracted, and the materials and fabrics used in the system can satisfy many of the materials criteria found in the different green building programs popular today. Keeping the interior sufficiently cool is, typically, one of the largest energy uses in a nonresidential building. For years, designing a facade with many windows seemed counterproductive to building efficiency because direct sunlight would pass through the windows, pour into the space, and heat it up, requiring the HVAC system to expend more energy to cool the interior down again. The problem, referred to as solar heat gain, occurred because direct beam solar radiation contains a lot of infrared radiation, which becomes radiant heat when it is absorbed. Sustainable design criteria, however, recognize the importance of offering building occupants exposure to daylight and views, forcing designers to add windows in a way that will not eat energy. Shading systems made from high-performance solar fabric provide thermal management of solar radiation in two ways. When the fabric is deployed, it creates an effective thermal barrier at the window by reflecting a significant portion of the radiant solar energy that passes through the window off of the exterior face of the fabric and back outside and trapping much of the remaining energy in the space between the glass and the fabric. Buildings equipped with shades that have a high solar reflectance have been shown to deliver HVAC energy savings in the range of 3 to 22 percent, depending upon facade design and other project properties. According to the Rocky Mountain Institute, improving employee comfort and productivity may offer a greater bottom-line benefit than energy savings. 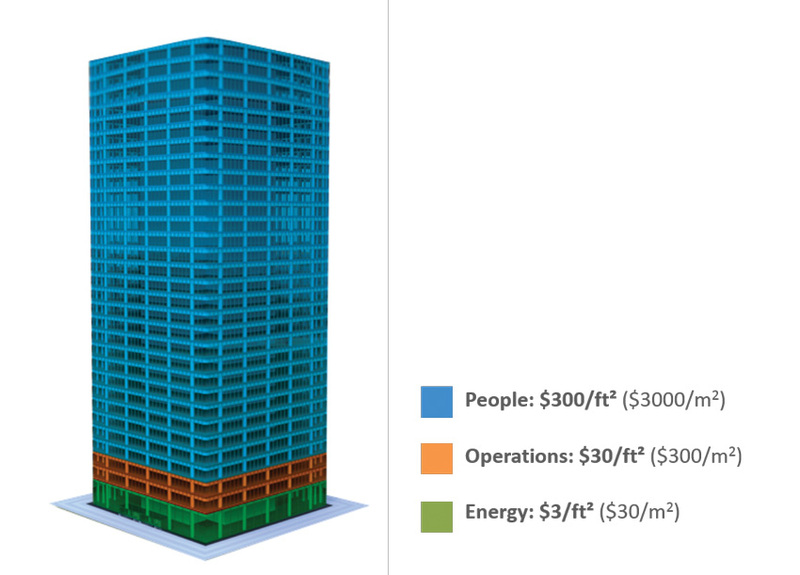 In 2012, the Rocky Mountain Institute published the Guide to Building the Case for Deep Energy Retrofits, in which it explained that while energy costs represent roughly $3 per square foot per year, the cost of people in a building is closer to $300 per square foot per year, putting a premium on the impact that improvements in productivity can make to the bottom line. These findings align with the goals of sustainable design to create healthy and productive spaces, positing that creating spaces that are good environments to work will, in turn, contribute toward good work getting done. Studies conducted by the Heschong Mahone Group and others have shown that providing access to daylight and views throughout the day creates spaces in which employees are more satisfied, students learn faster, and patients experience shorter recovery times. In short, daylit spaces and spaces that offer a view of the outdoors enable the people within to be more productive. Unfortunately, daylight is an incredibly dynamic light source, and not all daylight is usable or practical in a typical interior environment. For example, on a sunny day, the intensity of daylight may reach up to, or over, 10,000 footcandles (fc). Light with this level of intensity may cause discomfort and distort the balance of the visual environment if it passed freely into a space. The daylighting industry recognizes the different types of daylight and has attempted to distinguish between useful daylight and daylight that should be controlled, coining the phrase “useful daylight” to describe daylight that will not cause glare or discomfort to occupants in a building. In an office setting, the range of useful daylight illuminance is generally considered to be between 10 fc and 200 fc measured at the workplane. This range of useful daylight aligns with recommendations developed by the IES that define optimal light levels for various visual tasks. The IES recommends that office buildings maintain 30 fc at the workplane in private offices, open office spaces, and conference rooms. Automated solar shades maximize the presence of usable daylight in the interior space by automatically deploying when daylight is direct or overly intense to protect the interior environment, and then automatically retracting when useful, ambient daylight is available. This automated functionality delivers two important sustainability benefits. It maximizes a building occupant’s exposure and access to useful and glare-free levels of daylight because the shades are only deployed when daylight must be managed and are raised whenever possible. And, if the lighting system is equipped to reduce lighting levels or turn off when sufficient daylight is available, an automated shading system will create the greatest potential for lighting energy savings because it allows the greatest amount of usable daylight into the interior.